Sat in front of my computer musing idea's over I thought I should set up a Sea Kayaking Adventures Channel on You Tube. I love watching other peoples kayaking videos so I'm going to spend some time this year working on some new vid's. In the meantime I've uploaded some previous vid's I've done & re-edited & cleaned up the footage on a few. I've not linked them to the blog yet so please use the link below to view them. 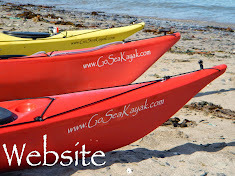 Please click this link to see the Sea Kayaking Adventures Channel & please subscribe & share.